Here comes the most interesting part of your journey with us, where you can upgrade your subscription with us and unlock all the exclusive features. To upgrade your plan, just click on Upgrade plan button, you can find your current plan at the top-middle section of the dashboard. Once you click on it you can find the package Comparison Screen. Once the Agent will click on Upgrade now button, it will show what is the current plan of the Agent and also it will display all the plans, you can select any of the plans and can upgrade the plan as per Agent’s requirement. 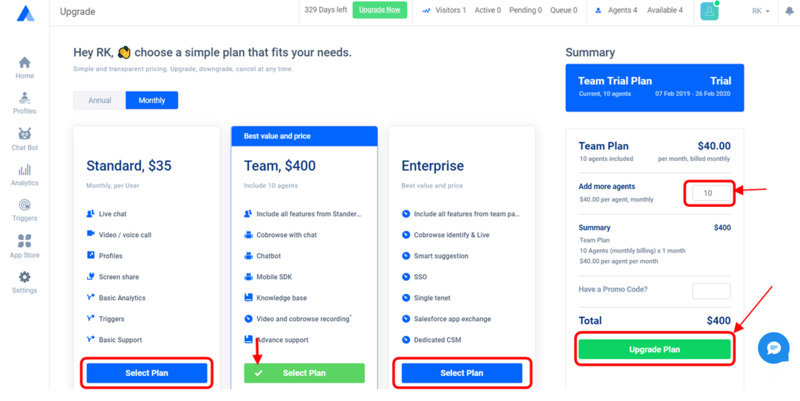 Here, on this Package comparison screen you can Select the plan you would like to buy, also can add agents to your plan and click on “Upgrade Plan” . Once done, your profile will have all the unlocked features of the paid subscription that you just bought with us.